"He Has No Idea, NO IDEA, of how Bad his Market Calls are" - This article continues on from where the last one left off ( Why Watching CNBC Could Destroy Your Portfolio) in the deconstruction of CNBC talking bobble heads repeatedly bullish market calls whilst the stocks bear market continued to rage, that continued to destroy the value of CNBC viewers portfolios. This article focus's CNBC's chief stock picking guru, Jim Cramer's market calls against actual outcomes which will hopefully prevent the further destruction of portfolio values. 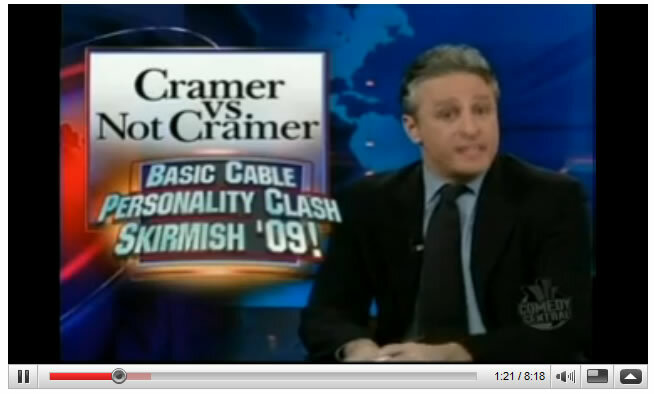 6 Days Later - Bear Stearns Loses 90% of its value, and Jim Cramer attempts to revise history about what he implied on the 11th, but the video does NOT lie. HIS STOCK PICKING CNBC SHOW, WHILST REFERRING TO THE BEAR STEARN'S STOCK PRICE TOLD INVESTORS TO STAY PUT! 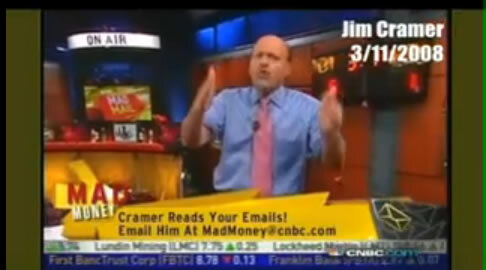 13th June 2008 - Jim Cramer's bull market buy calls - Says buy Banks, Buy Brokers, Wells Fargo, JP Morgan and tech stocks, and home builders, retailers. Says NOT to buy oil and gas. 20th June 2008 - Jim revises history, he says - If you own banks and retailers then you are like the golam, not listening to him. He says if you own banks, home builders and retailers then you will be in pain, despite the fact that he specifically recommended buying bank stocks and retailers a week earlier. Now he says the most important sector he recommends that you should have bought is oil and natural gas, whilst forgetting that the previous week he said NOT to buy them ! Jim Cramer Keeps Calling the Bear Market Bottom Again and Again and Again. Jon Stewart, the latest to join in, in attempting to hold Jim Cramer and CNBC to account for what passes for financial journalism that has led the millions of investors who watch CNBC into near total portfolio wipeout. In closing, I refer back to one of Jim Cramer's infamous rants - "He has No idea, NO IDEA how bad his market calls are, NO IDEA, CNBC Viewers should cut the volume, CUT the Volume, CUT THE VOLUME, before their Portfolio hits ZERO". 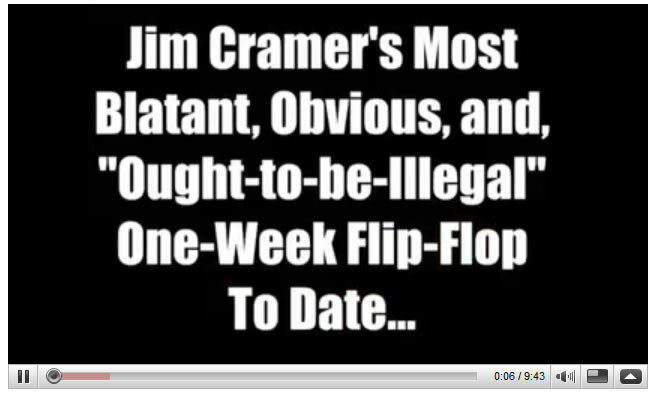 Cramer, his CNBC & media buddies, do NOT make bad calls. They make calls according to what stocks they, or their hedge fund buddies hold, long or short & then fleece the poor suckers who follow their calls. it is disgusting, pathetic but funny watching CNBC's Jim Cramer shamelessly beat the drum for his financial industry masters. 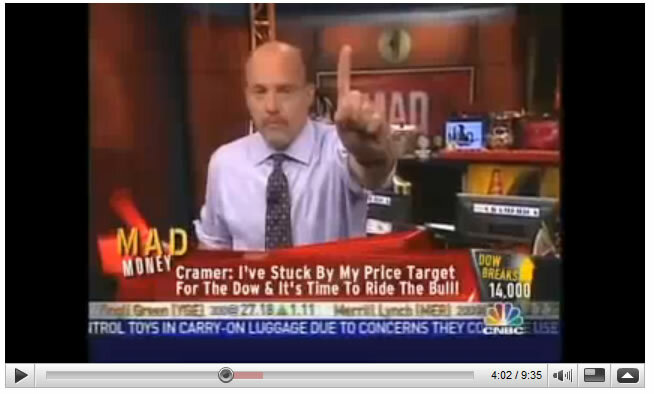 Cramer's shameless pro-sell contortions in the face of a growing crisis make a under-dressed tart look respectable. ---nah...he's not on the payroll of any fat cat financials, is he? " If he generally make people to loose when following him, I think we just have to do the reverse of what he says. Let's give a try, maybe it works, who knows. If it works, then he would be pretty good for us to do Reverse Cramer.